Jinguuji-san. The woman Kokone-chan and I had met when we were investigating the airport. The large words 'Jinguuji Style Master' written on her suitcase left quite an impression. Her hair was tied with some rather large kanzashi hair ornaments. They were clearly made of wood and quite sharp at their point. Sufficient enough as a weapon... I lifted my head, having found a breakthrough. But Prosecutor Garyuu bashed down my elation with ease. Prosecutor Garyuu snapped his fingers. And on cue the courtroom doors opened to admit that woman – Jinguuji-san. ... She seemed far more dolled up than necessary. Her kimono sash shone and her hair's volume seemed to be five times what it was at the airport. Speaking of her hair, it still had those kanzashi. Jinguuji-san continued to shill her services, until the judge cut her off. Anyway, with her Jinguuji style etiquette (I guess? ), she began her testimony. Jinguuji-san, well aware that Prosecutor Garyuu and the judge were hanging on her every word, rattled on as if reciting a poem. With the testimony finished for now, Prosecutor Garyuu asked a question. Jinguuji-san's face reddened, and she pulled out a compact case to fix up her make up as she answered. I looked at Jinguuji-san. Not at her face, but at the kanzashi in her hair. I cut off Jinguuji-san's sales pitch. Jinguuji-san answered with a disapproving glare. I walked over to the witness stand. Jinguuji-san removed her kanzashi and handed it to me. I took a look at the pointed end of the kanzashi. They're sharp, not not as sharp as the ice pick. I doubt they'd break someone's skin. Besides, Uranashi-san was stabbed through his shirt as well. Prosecutor Garyuu asked with amusement. Unfortunately, I could only shake my head. Prosecutor Garyuu added to the statement. Although he was one of the people to touch the fallen Uranashi-san. As a doctor, he would be well versed in poisons. I should check him out just in case. Prosecutor Garyuu shook his head in response to my question. Prosecutor Garyuu flatly denied the possibility. Jinguuji-san had pulled out her compact case again, touched up her face, and smiled at Prosecutor Garyuu. I cut Jinguuji-san off and took a deep breath. Jinguuji-san's testimony had been fairly solid up until now, but I'd just found a huge contradiction. Jinguuji-san stared blankly for a moment in response to my assertion. Jinguuji-san's behaviour took a 180 degree turn. Her mask of composure was crumbling to reveal her true face. Jinguuji-san fanned herself franticly as she sweated profusely, before finally hanging her head in resignation. Her previous bravado having faded like an illusion, she spoke in a deflated manner. Jinguuji-san covered her face as she squirmed about. ... I've suspected it for a little while... but Shirai-san is apparently this woman's type. Jinguuji-san returned to her previous tone of voice as she cut off my assertion. Alright... I'm finally catching a glimpse of the truth! It seems Prosecutor Garyuu wasn't expecting this development. The cool smile he'd been floating until now had disappeared as he began to sweat, staring right at me. Prosecutor Garyuu was left speechless. The judge nodded. Standing there was none other than Shirai-san. 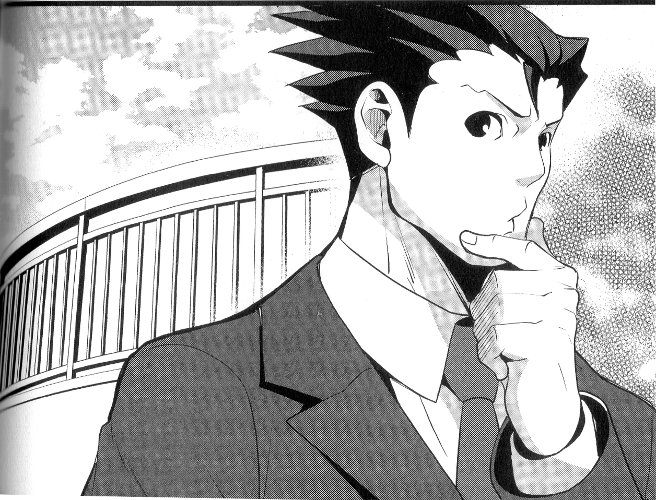 Shirai-san stood calmly at the witness stand as he adjusted his neck tie with one hand. This is where I step up. I turned to face Shirai-san. Shirai-san cut me off, shaking his head in disappointment. Prosecutor Garyuu spoke as if reading my thoughts. Shirai-san gave a bitter laugh as he shrugged. Shirai-san continued pressing for answers. Kokone-chan gave me a forlorn look. Think. There has to be a contradiction somewhere. Odoroki-kun isn't a killer... Which leads me to ask... who killed Uranashi-san... and how? It's hopeless. I can't think of anything. The timing with which Uranashi-san fell, the ice pick, everything points to Odoroki-kun as the killer. Kokone-chan snapped, unable to contain herself. It was none other than – Prosecutor Garyuu. Shirai-san raised an eyebrow in suspicion. The judge shook his head. Prosecutor Garyuu spoke smoothly as he played his air guitar. Kokone-chan had her hands clasped together as she jumped for joy. But we're safe for now. It's an odd feeling for your opponent to pull you out of the fire at the eleventh hour, but that's just the kind of guy Prosecutor Garyuu is.